Pharyngitis, more commonly known as sore throat, is one of the conditions experienced by many people. It can cause a person to feel itchy somewhere in the throat due to inflammation of the pharynx. This results to making the act of swallowing painful. For most cases, it could be a sign of other respiratory illnesses caused by viral or bacterial infections such as cold or flu. On the other hand, complications are not a far cry should the condition become too frequent or severe. 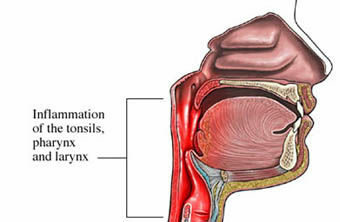 The common pharyngitis includes symptoms such as cough, mild headache, sneezing, and low fever at less than 102°F. It is commonly encountered during the cold seasons or when someone around is already infected. It can also spring from smoking or being exposed to secondhand smoke, having frequent sinus infections or allergies. The treatment for this illness can be through various self-medication means. Drinking warm liquids tops the list. Gargling with a cup of water with ½ teaspoon of salt several times a day is also another common remedy. The soreness of the throat can be soothed through sucking on hard candies or throat lozenges. Using a cool-mist vaporizer or humidifier in a room can also help create a moist environment for the dry throat. Natural remedies may also be helpful. These are typically in form of natural herbal extracts, ointments or oils such as those from eucalyptus and licorice. Herbal teas like chamomile, sage and blackberry have also been known to provide relief once used for gargling or consumption. But these measures may not be enough for people who may be inflicted with complications such as airway blockage, abscess around the tonsils or behind the pharynx, scarlet fever, rheumatic fever, swollen spleen, and liver inflammation. If the sore throat does not go away within a week, it is best to consult a doctor. Other indicators that one might be suffering from a severe case of pharyngitis include experiencing chills, body aches, skin rashes, difficulty in breathing, loss of appetite, and enlarged lymph nodes in the neck and armpits. The doctor would first check the body temperature and perform examinations to the throat, sinuses, ears, nose, lungs, and neck. The doctor might also ask for a throat culture, a rapid strep test or blood test to check for mononucleosis. Consequent tests might be administered depending on the primary results. One common measure doctors follow is suggesting confinement at the hospital for a few hours to permit making elaborate observations. On the other hand, the doctor might only prescribe nutritional supplements or medications in higher dosage so as to prevent the pharynx from being more swollen. These would include milk with probiotics (popularly known as the good bacteria that help prevent infections), vitamin C, zinc, and supplements made from garlic or ginseng. Having pharyngitis might often be neglected by a lot of people as it is dubbed to be an illness that simply goes away. But given the possible risk factors and complications associated with it, one should be more cautious in taking care of his or her pharynx.